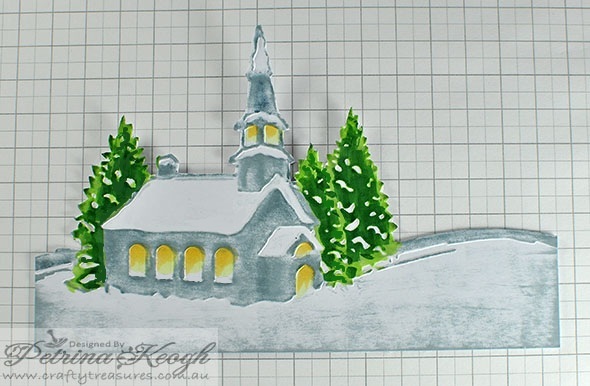 Hi Crafty friends, I have a Christmas card tutorial to share with you. My Christmas cards were a tad rushed this year, I was certain I was not going to get any made. 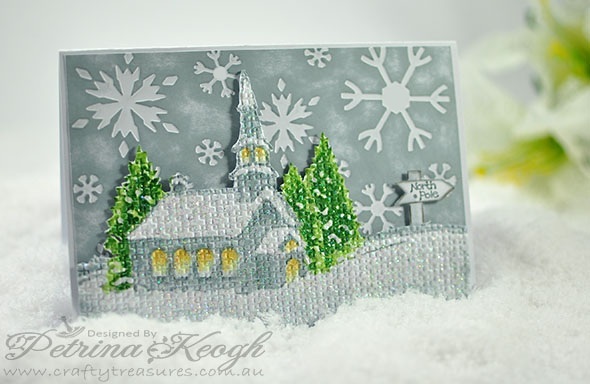 I did manage at the last minute to make two different styled cards, this being one of them, so I thought I would share how I made this card. 1. 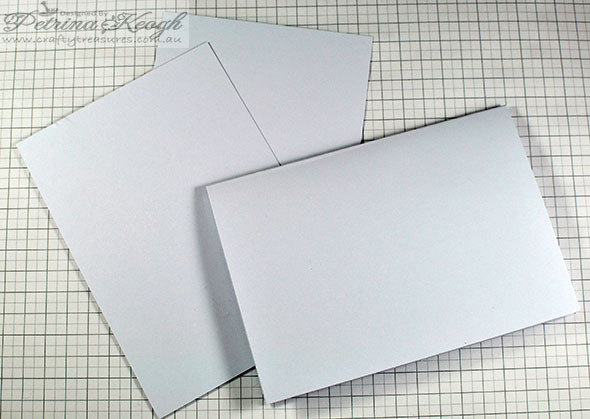 Cut your A4 cardstock in half on the long edge, so you have 2 x A5 pieces. Fold one of them in half for your card base. Cut the other piece in half again (picture shown above). 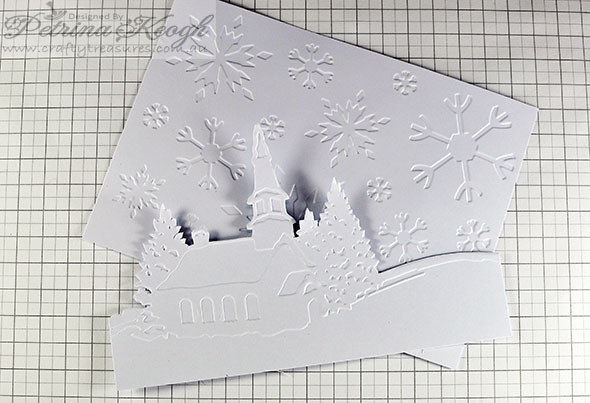 Emboss both the single pieces separately with Embossing folders/Crafts Too – Winter village & Papermania – Snowflake. 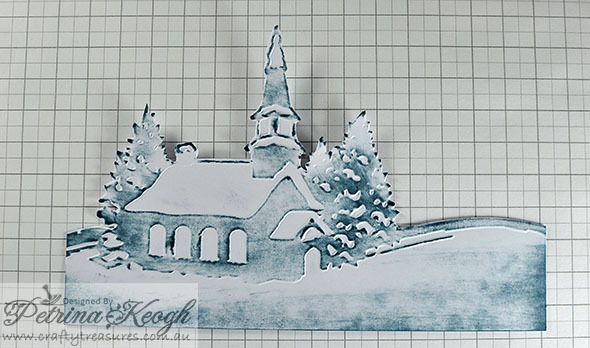 Cut out around the outer edge of the Embossed/Winter Village. 2. With your weathered wood – distress ink, on the side that the snowflakes are recessed. 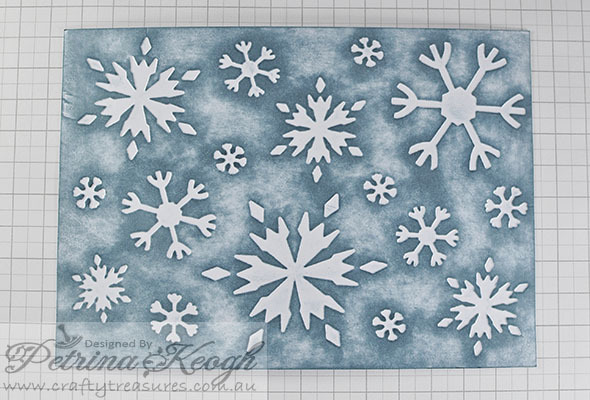 Swirl your distress ink gently/directly onto the snowflake background (my weathered wood/Distress Ink, could do with a re-ink). Keep swirling until you have it completely covered (the pic above was taken while it was wet), so you can see at what stage I stopped. You make like to show a bit more white and stop swirling a bit earlier. 3. Do the same steps as step.2 for the winter village as well. The snow at the bottom I came in from the sides and swiped across, rather than swirled. 4. I have high-lighted different sections of the Winter Village, to give it a bit more definition. 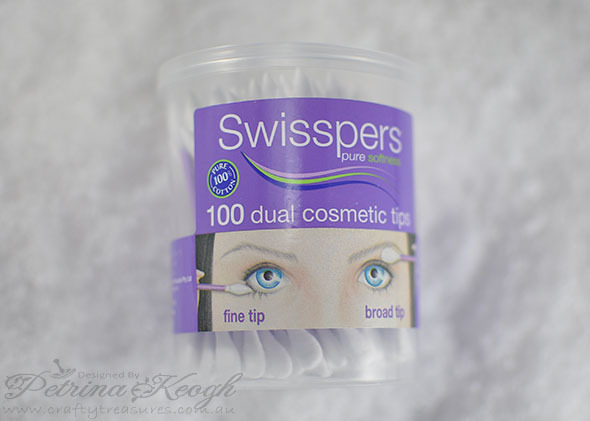 I used some cotton tips called Swisspers, they are quite firm and have a fine tip as well as a broad tip. I recommend the cotton tips, they are great. I used the fine tip to do the high-lighting. 5. 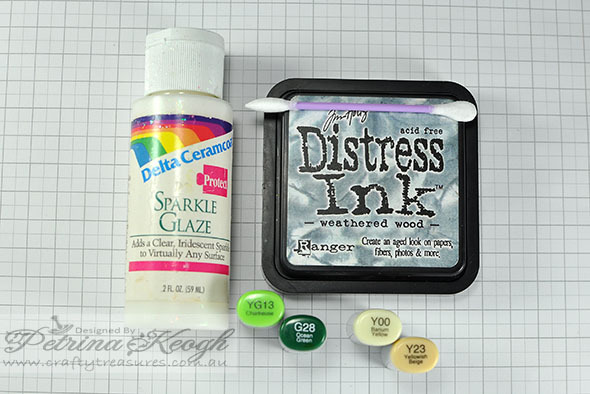 Here is a guide of the high-lighted areas, I highlighted with a cotton tip and weathered wood – distress ink. 6. Take your Copic marker Y00 , color two thirds down from the top of all windows and front door. Then do the same with Y23, but only come down 1 third from the top. Note: There is no need to blend these copic colours together. Take a Copic Marker YG13 and colour the whole area on the pine trees, and then with G28 highlight the inner part of each pine. 7. 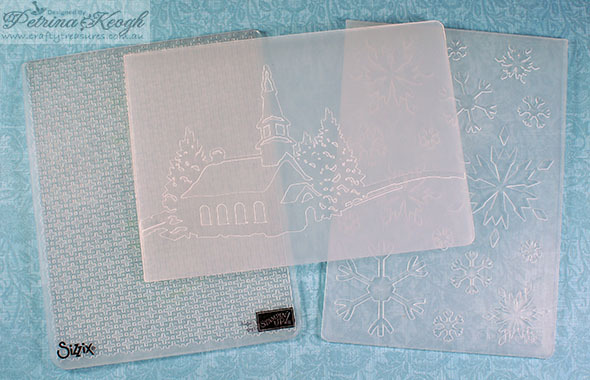 Emboss the design with Stampin’ Up! – Embossing folder/Square Lattice. You will find this won’t fit lengthways, but you can roll it 2/3 the way, and flip the Winter Village around and emboss the other side. Note# Once you have flipped it around to emboss the other side only roll it 2/3 thirds the way and back out, so you don’t end up with a flat spot from the edge of the folder. 8. 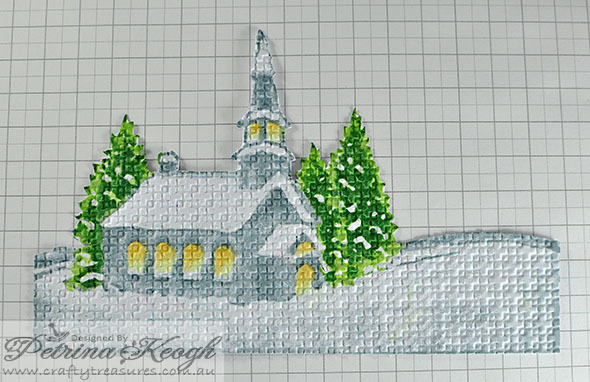 I painted some Sparkle Glaze over the Winter Village and adhered it to the Snowflake background. I adhered the bottom edge with double sided tape and from the windows up I used 1-2 mm foam adhesive, to gave it some lift. I trimmed this finished piece to fit the A5 folded base card. I added a tiny sign that reads North Pole, from a very old Imaginations stamp. Hi Petrina! What a gorgeous peaceful scene you have created. Thank you for this wonderful tutorial and clear instructions. All the pictures make it so easy to follow your instructions. 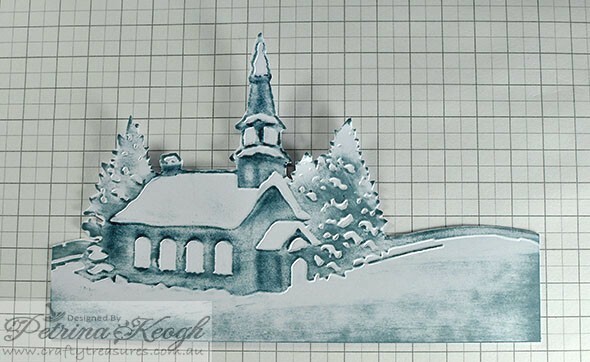 I will have to review my collection of stamps and embossing folders to create a card using this technique. 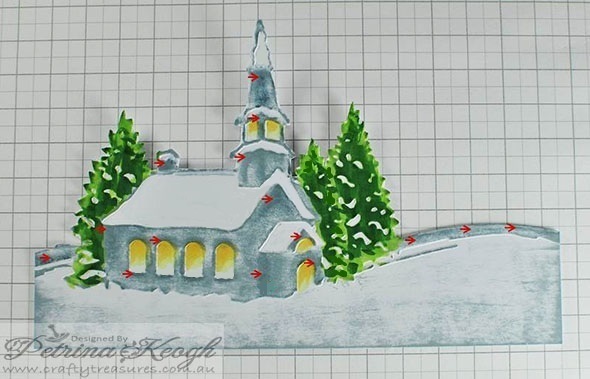 Will it be OK to use Inktense pencils to do the colouring of windows and trees instead of Copic markers? I know one day I will have to buy some Copic markers! Can you suggest what would be good colours to start with? Love your work and thanks again.